This workhorse is now free to roam. This FJ lived an adventurous life. First, it was a delivery vehicle for a bakery founded by one of its owners. Then, its final owner, a rancher, used it as his main car. “These cars were made to last forever,” he said. 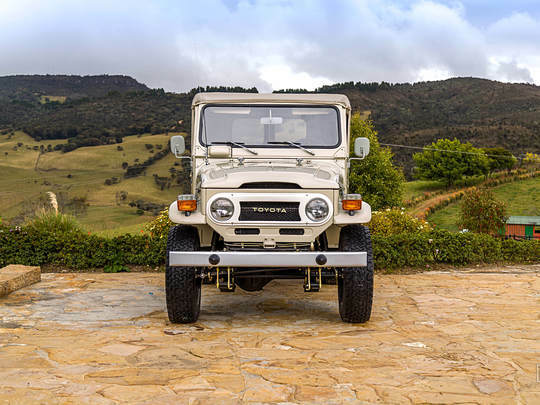 It received a comprehensive, factory-correct restoration to original specifications by The FJ Company. This job included renovating the engine, transmission and transfer case. The body was media blasted prior to the paint job and other systems and parts were reconditioned as needed. This car features a new soft-top, complete interior restoration, new seats, new rear drum brakes and new front disks. Every emblem, headlight and signal was replaced in order to achieve a mint look and proper functioning. Finally, wheels were mounted with brand new rims and tires that afford an easy ride.